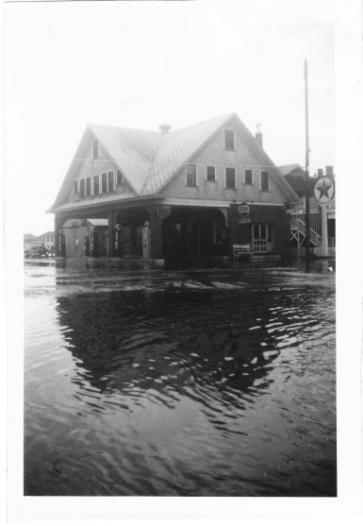 Judy Moore has brought us some pictures from a 1946 “flood” but we’re not sure if that’s from a hurricane or not – as there is no hurricanes listed in the historical records for Southeast NC in September of 1946. Dorothy Farrow McQuillan was born in Wilmington, North Carolina November 20, 1937 the third of nine children – 3 boys and 6 girls. She was born at home where they lived on the Carolina Beach side of the swing bridge up on the hill where Pleasure Cay is now. Dot’s people used to own that land. She was delivered by a mid-wife, either Lizzie or Miss Hannah. But her birth date was listed as the 27th, the day it was recorded downtown. As children they played under oak trees down next to the water where they went to swim. Dot was not a water person. Her Momma used to tell them “Don’t y’all cross to Carolina Beach to the inland waterway.” People would swim in what they know as the canal where drowning most likely happened with the tides. Some of Dot’s Freeman cousins were drowned there. They were just children back then in the 30s and 40s playing stick ball and doing kids stuff – run and play and hop and skip and jump and growing up. They had an old play house where they used old pots to pretend they were cooking. They had a big open field with yellow white sand. They called white sand their rice or grits, the yellow sand was the eggs, and the poke leaves were the collards. The polk berries were used to make “pretend” Kool Aid. They walked all the way down Old Dow Road and picked plums and briarberries (blackberries). They made dolls with clothes from old material and rags. They platted or braided straw for doll hair with ribbons. They called the dolls their children. When grownups were visiting, the kids place was supposed to be outside. As the older generations started dying out, they sold their land. Dot would like to see the area stay just like it is because if someone were to come in and take over, it wouldn’t be like it is now. Dot’s family had a pump, a well, and a big tin tub for bathing. The water didn’t have to be heated in the summer – just leave it out in the sun to warm. In winter, water was heated on the stove. With no electricity, they used oil lamps for light. Their first radio – an old Philco – used a battery. Windows were opened when it was hot so mosquitoes got in. Windows had big shutters. An ice man brought ice. Trash, boxes and stuff, were burned in a drum out in the yard. They don’t want you to burn trash now because of the fire hazard. No one worried about anybody breaking in and stealing. If people came through your yard and wanted some water, they would help themselves and leave you a little note saying thank you. Now you have to lock up everything. Dot’s mother loved the outdoors – oystering and clamming. 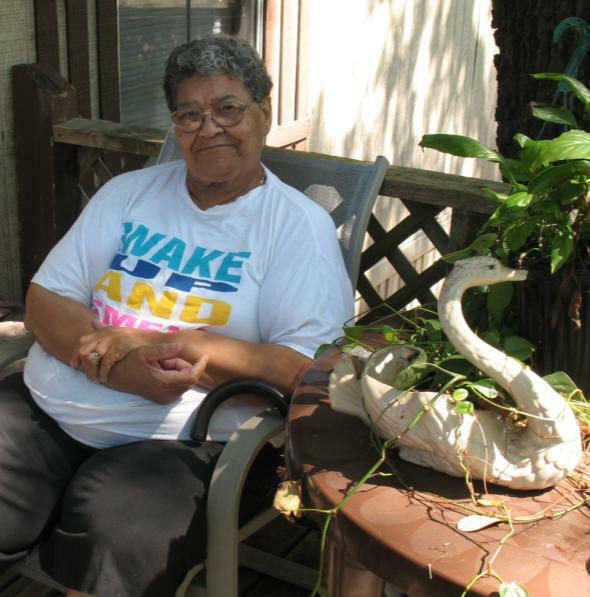 She worked at Carolina Beach cleaning motels and cooking for restaurants. Dot started working at the Chinese Restaurant when she was about 12. 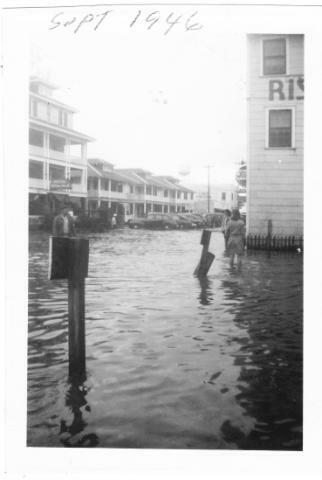 It used to be David’s Restaurant on Carolina Beach going down to the dock, just before the gas station, right on that corner near Hardee’s. The Federal Point Historic Preservation Society held its monthly meeting on Monday, August 15, 7:30 pm at the Federal Point History Center, 1121-A North Lake Park Blvd., adjacent to Carolina Beach Town Hall. In 1986 Susi Clontz was working at the North Carolina Aquarium at Fort Fisher. She befriended many people including school teacher Charlie Baker. Charlie was also the sea turtle monitoring coordinator of Figure Eight and Hutaff Islands. After many conversations with Susi about animal conservation, Charlie mentioned that Kure Beach was in need of a coordinator and thought Susi would be perfect for the job. Being the country girl that she was, Susi was somewhat reluctant but Charlie persisted promising to teach her all she needed to know about sea turtles. In 1987 with new found knowledge and permit in hand Susi began her first season as sea turtle monitoring coordinator of Kure Beach. At first she walked the three miles of beach every morning alone searching for signs of nesting turtles – something that she had only seen in pictures. It didn’t take long before she realized that she couldn’t do this by herself so she drafted her husband Rusty who was willing to help but just as inexperienced as Susi. Neither of them had ever seen a real crawl. They were told it looked like a single tractor tire track coming out of the water and going back in. They did finally find one that season and the excitement was overwhelming. They were hooked for life. For many years it was just Rusty and Susi but along the way they gathered others that were just as interested in helping save the sea turtles as they were. In 2001 the volunteer program was officially put in place to help Susi and Rusty with nest monitoring and in 2003 “The Pleasure Island Sea Turtle Project” was born and became incorporated as a non-profit organization. Susi and Rusty were surprised at the overwhelming support they received from the community. They had no idea there were so many people who loved sea turtles as much as they do.